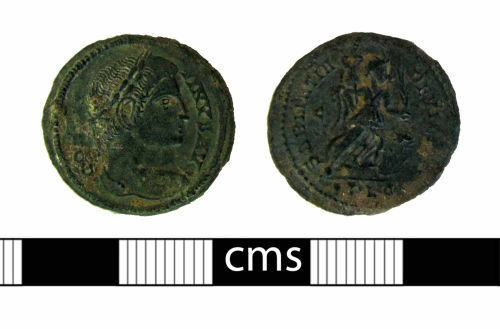 A complete copper alloy Roman nummus (AE3/4) of Constantine I (AD 307-337) dating to the period AD 318-324. Reece Period 16. SARMATIA DE VICTA reverse type. Mint of Lyon. Reverse description: Victory advancing right, treading on captive. A copper alloy Roman nummus (AE3) of Constantine I (AD 307-337), dating to the period AD 318-324. Reece period 16. SARMATIA DE VICTA reverse.